With their best record since 2009, the Marlins are off to a hot start. Finally. After today’s loss to San Diego the Fish are a division leading 5-2. As a life-long fan it’s a great feeling to be doing this well, but its hard to not keep wondering when it’s going to all come crashing down. 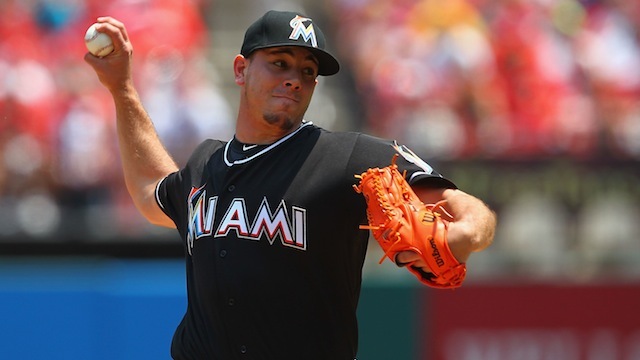 Jose Fernandez has been absolutely dominating in his first two starts, posting an ERA of 0.79 in 12 2/3 innings. He has done an incredible job commanding both his fastball and off-speed stuff. He’s allowed just 8 hits and fanned 17. With stats like these and Dodgers ace Clayton Kershaw expected to be out until sometime in May, I really think that Fernandez will have a real shot at grabbing the NL Cy Young award as long as the offense can keep getting runs and getting Jose the wins he needs. The best part about the Marlins’ rotation is that behind Fernandez are 4 more arms that are capable of keeping others teams off the bases, and in turn keeping runs off the board. With the oldest member of the rotation being Tom Koehler at 27 years old, most of the starting pitchers are not allowed to legally rent a car. The closer Steve ‘Shrek’ Cishek has completed 30 saves in a row, rolling over from last year, which is currently the longest in baseball. With guys like Nathan Eovaldi, Henderson Alvarez, and Jacob Turner to fill out the rotation, and Brad Hand, Kevin Slowey, and the reliable AJ Ramos waiting in the bullpen, it seems that the future of Miami pitching is long and bright. So, last season the Miami Marlins were last in a lot of categories. Last in wins in the National League, last in Home Runs, last in batting average, but the one category that the Marlins were at the top of was worst single player WAR (wins above replacement) in baseball. Adeiny Hechavarria posted a terrible -1.9 WAR. What the meant was that according to his stats, Hechy’s replacement would have won them 1.9 more games. Needless to say that after a year like that, there is no place to go but up right? Well it sure seems that way so far. Since opening day, Hech has hit an astounding .458 in 25 plate appearances. He hasn’t been making up for his bat by slacking on his defense either. He currently has 21 assists, and only committed one error. I am really excited for what he will do by the end of the season. Watching him from game to game it seems as though what ever pointers the new hitting coach Frank Menechino gave him he really took to heart. His at bats are longer and he seems more comfortable in the box. I really believe after only six games this season that the Marlins are due to impress and surprise a lot of people this season. All of the batters are taking longer and more disciplined AB’s, the pitchers are doing well at keeping the team in the game, and the team as a whole seems to have a real positive mind set this season and the determination to play one game at a time and grind out wins. Posted in MLB, Podcast.Tagged baseball, jose fernandez, marlins, Miami Marlins, MLB, opinion, personal, pitcher, pitching. Previous Post What Do The Panthers Do?